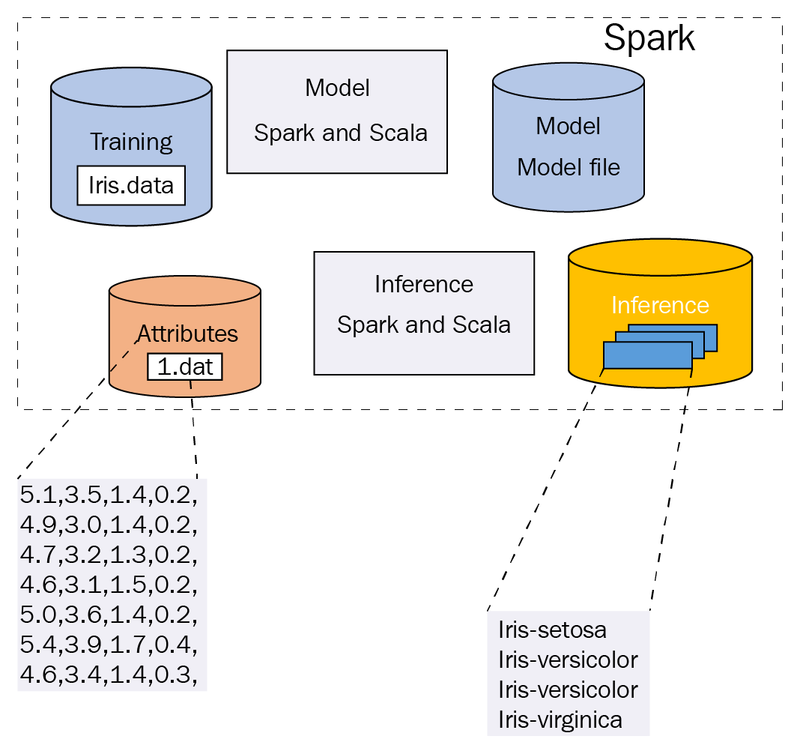 The Iris dataset is the simplest, yet the most famous data analysis task in the ML space. In this article, you will build a solution for data analysis & classification task from an Iris dataset using Scala. This article is an excerpt taken from Modern Scala Projects written by Ilango Gurusamy. The following diagram represents a more detailed description of the different phases in terms of the functions performed in each phase. Later we will come to visualize pipeline in terms of its constituent stages. A data cleansing phase, or pre-processing phase. An important phase that could include a subphase of Exploratory Data Analysis (EDA) (not explicitly depicted in the latter diagram). Referring to the preceding diagram, the first implementation objective is to set up Spark inside an SBT project. An SBT project is a self-contained application, which we can run on the command line to predict Iris labels. In the SBT project, dependencies are specified in a build.sbt file and our application code will create its own SparkSession and SparkContext. Head over to the UCI Machine Learning Repository website at https://archive.ics.uci.edu/ml/datasets/iris and click on Download: Data Folder. Extract this folder someplace convenient and copy over iris.csv into the root of your project folder. 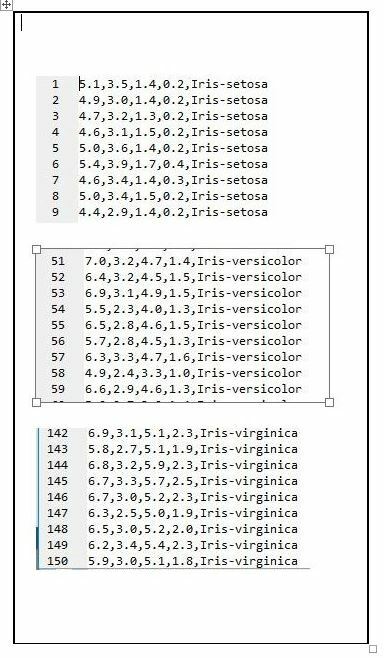 You may recall that the iris.csv file is a 150-row file, with comma-separated values. Now that we have the dataset, the first step will be performing EDA on it. The Iris dataset is multivariate, meaning there is more than one (independent) variable, so we will carry out a basic multivariate EDA on it. But we need DataFrame to let us do that. How we create a dataframe as a prelude to EDA is the goal of the next section. Before we get down to building the SBT pipeline project, we will conduct a preliminary EDA in spark-shell. The plan is to derive a dataframe out of the dataset and then calculate basic statistics on it. We will then port that code over to a Scala file inside our SBT project. That said, let’s get down to loading the iris.csv file (inputting the data source) before eventually building DataFrame. Lay out your SBT project in a folder of your choice and name it IrisPipeline or any name that makes sense to you. This will hold all of our files needed to implement and run the pipeline on the Iris dataset. The build.sbt file referenced in the preceding snapshot is readily available for you in the book’s download bundle. Drill down to the folder Chapter01 code under ModernScalaProjects_Code and copy the folder over to a convenient location on your computer. Drop the iris.csv file that you downloaded in Step 1 – getting the Iris dataset from the UCI Machine Learning Repository into the root folder of our new SBT project. Refer to the earlier screenshot that depicts the updated project structure with the iris.csv file inside of it. Create the Scala file iris.scala in the com.packt.modern.chapter1 package. Up until now, we relied on SparkSession and SparkContext, which spark-shell gave us. This time around, we need to create SparkSession, which will, in turn, give us SparkContext. What follows is how the code is laid out in the iris.scala file. The following is an example of a dataSet parameter string: "C:\\Your\\Path\\To\\iris.csv"
The resulting RDD contains two partitions. Each partition, in turn, contains rows of strings separated by a newline character, '\n'. Each row in the RDD represents its original counterpart in the raw data. In the next step, we will attempt several data transformation steps. We start by applying a flatMap operation over the RDD, culminating in the DataFrame creation. 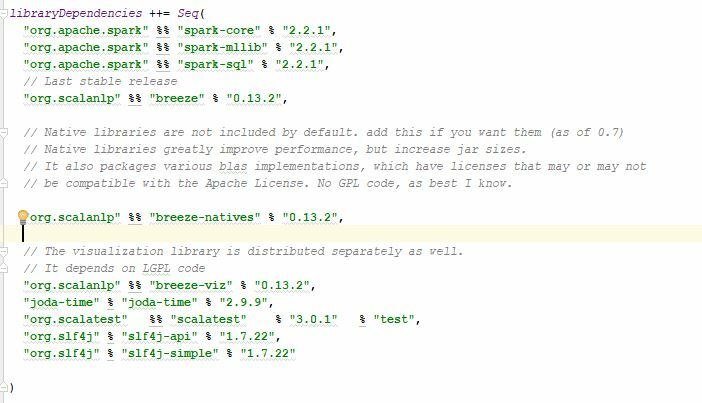 DataFrame is a view over Dataset, which happens to the fundamental data abstraction unit in the Spark 2.0 line. We will get started by invoking flatMap, by passing a function block to it, and successive transformations listed as follows, eventually resulting in Array[(org.apache.spark.ml.linalg.Vector, String)]. A vector represents a row of feature measurements. There are 150 rows in all. Look at the IrisPipeline.scala file for values of each of these parameters. But this time, we will employ an exhaustive grid search-based model selection process based on combinations of parameters, where parameter value ranges are specified. Next, set the hyperparameter num_trees (number of trees) on the classifier to 15, a Max_Depth parameter, and an impurity with two possible values of gini and entropy. Finally, do a fit and a transform with our training dataset and testing dataset. Great! Now the classifier is trained. In the next step, we will apply this classifier to testing the data. Next, we fit this estimator over the training dataset to produce a model and a transformer that we will use to transform our testing dataset. Finally, we perform a validation for hyperparameter tuning by applying an evaluator for a metric. That brings us to the next step, an evaluation step. We want to know how well our model performed. That is the goal of the next step. In this section, we will test the accuracy of the model. We want to know how well our model performed. Any ML process is incomplete without an evaluation of the classifier. Set the label column, a metric name, the prediction column label, and invoke evaluation with the validatedTestResults dataset. Note the accuracy of the model output results on the testing dataset from the modelOutputAccuracy variable. The other metrics to evaluate are how close the predicted label value in the 'predicted' column is to the actual label value in the (indexed) label column. These metrics represent evaluation results for our classifier or classification model. In the next step, we will run the application as a packaged SBT application. The package command created a JAR file that is available under the target folder. In the next section, we will deploy the application into Spark. At the root of the application folder, issue the spark-submit command with the class and JAR file path arguments, respectively. Creates training, testing, and validation datasets. Creates a Random Forest classifier model. Tests the accuracy of the model. This is the most important part—the ML classification task. To accomplish this, we apply our trained Random Forest classifier model to the test dataset. This dataset consists of Iris flower data of so far not seen by the model. Unseen data is nothing but Iris flowers picked in the wild. Applying the model to the test dataset results in a prediction about the species of an unseen (new) flower. 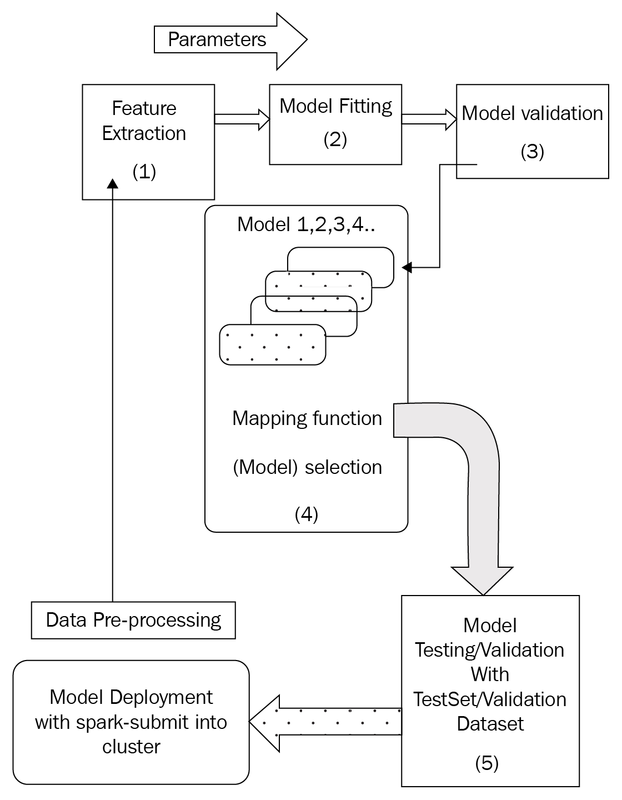 The last part is where the pipeline runs an evaluation process, which essentially is about checking if the model reports the correct species. Lastly, pipeline reports back on how important a certain feature of the Iris flower turned out to be. As a matter of fact, the petal width turns out to be more important than the sepal width in carrying out the classification task. Thus we implemented an ML workflow or an ML pipeline. The pipeline combined several stages of data analysis into one workflow. We started by loading the data and from there on, we created training and test data, preprocessed the dataset, trained the RandomForestClassifier model, applied the Random Forest classifier to test data, evaluated the classifier, and computed a process that demonstrated the importance of each feature in the classification. If you’ve enjoyed reading this post visit the book, Modern Scala Projects to build efficient data science projects that fulfill your software requirements.